Weekly themed water ski show complete with colorful costumes. Human pyramid, ballet line, barefooting, doubles, swivel, trios and more are performed to lively music. 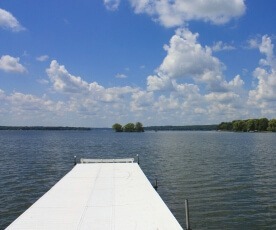 Featuring water skiing acts such as pyramids, ladies ballet line, trick skiing, barefooting and short skits accompanied by fun, energetic music. 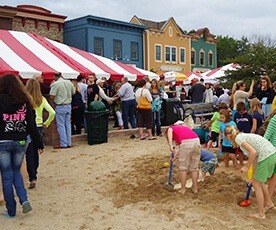 The street is blocked off for this two day lakefront event filled with water activities, water ski show, children's activities and entertainment, live music, food, refreshments and all-you-can-eat pancake breakfast. Themed water ski show complete with colorful costumes. Human pyramid, ballet line, barefooting, doubles, swivel, trios and more are performed to lively music. 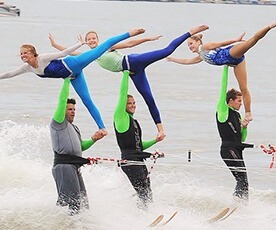 The final show of the season, this themed water ski show is complete with colorful costumes. Human pyramid, ballet line, barefooting, doubles, swivel, trios and more are performed to lively music.